Before January this year, the villages in Traditional Authority (T/A) Kasisi in Chikwawa North, 15 kilometres (km) from the boma and two km from Shire River, were without electricity. 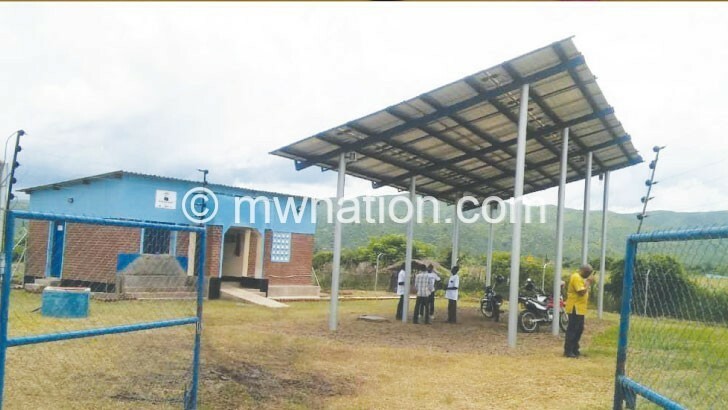 But that is history now, thanks to a solar mini grid planted in Mwalija Village, which is producing 15 kilowatts (kW) of electricity and a standalone solar kiosk in Chipula Village, five km away from the grid. Now the joy of having power in the area is seen on everyone’s face. To these rural communities, the solar energy has opened a window of opportunities, so they say. Expressing her joy, 36-year-old Ellina Phanga from Chipula, who owns a hawker just a stone’s throw away from the stand-alone grid, reckons life was challenging without power. “Since I was born, only residences around the boma were electrified. Every activity that needed electricity such as milling maize for us women required travelling a long distance to the boma,” she narrates. Smiling ear to ear, Phanga now no longer sleeps in darkness—she borrows lantern solar lamps from Chipula Solar Kiosk which stocks 450 charged lamps. To light her house, the woman needed one candle every night, which she would chop into pieces for all the other rooms; one candle costs K100. So she needed 30 candles every month, translating to K3 000. “But now the kiosk charges K1000 for the lamp for the entire month. The lamp is charged twice a month at K50,” she explains. Sharing the joy of electricity in the village are students who now can study at night. “As a Form Four student preparing for national examinations, I have gained much ground with my night studies,” says James Piseni, a student at St Michael’s Community Day Secondary School (CDSS) in the district. While people from seven villages surrounding the kiosk can borrow solar lamps, some people from the rest of the villages have their houses connected to the Mwalija mini grid. “Apart from lighting in my shop, I can now sell frozen water. I am also able to stock perishable products in the refrigerator,” brags Joseph Maideni, shopkeeper at Mwalija Trading Centre. Apart from tapping power for lighting in people’s houses and shops, the grid is also supplying power to Njeleza Primary School, four km away. There, two classes—Standard Seven and Eight— are electrified. According to deputy head teacher Burton Lipenga, the power supply has improved pupils’ performance at the school. “Pupils can now study at night at the school and teachers can conduct evening classes,” he says. In his joy, Chipula Energy Kiosk chairperson Harold Esiti says the solar energy will spur development in the area. On a larger scale, Ndalama Ward councillor Clement Kamoto explains that already people in the area have opened an irrigation scheme. “The scheme will not only employ people but also reduce hunger which communities experience almost every year,” he says. The irrigation scheme has 11.6 hectares and farmers will be growing maize, beans, soya beans, onions and vegetables three times a year. Chikwawa North, just like many villages in rural Malawi, has no access to hydro-electric power as Electricity Supply Corporation of Malawi (Escom) supplies about 12 percent of power to the entire population in the country. Owing to Escom’s limitation, from 2015 a consortium of Practical Action, Churches Action in Relief and Development (Card), Environment Africa and Hivos joined hands to put up four mini grids and seven stand-alone solar kiosks in Nsanje and Chikwawa to address power challenges in the districts through sustainable energy for rural communities (SE4RC) project funded by the European Union (EU) for 7 million Euros (about K5.9 billion) for Malawi and Zimbabwe. The project targeted areas that do not stand the likelihood of being connected to a national grid at least in the next five years. Each grid supplies power to a health facility, trading centre, school and irrigation scheme. Churches Action in Relief and Development (Card) executive director Melton Luhanga, whose organisation is one of those that implemented the project, says the aim was to reach about 20 000 people with the source of energy for lighting, home use and irrigation. “With this, communities will be doing business to generate money,” he says. Deputy Minister of Natural Resources, Energy and Mining Welani Chilenga hails such projects, saying they are complementing government’s efforts to bring electricity to rural masses. “As government we are making sure that power reaches everywhere, including rural areas as we know power can help communities to develop faster,” he says.